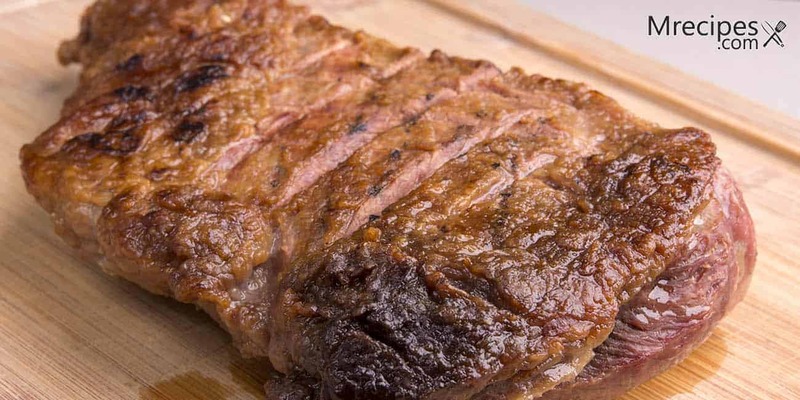 The tri tip roast is the triangular shaped muscle that sits right at the bottom of the sirloin. This is a fairly lean cut of beef. It is also economical because most people don’t know what to do with it, and many butchers tend to grind this for use in lean hamburger meat. I have to say, it is very tasty, especially when cooked over smoke or fire. Slow smoking in the Masterbuilt Digital Electric Smoker is a great way to cook this cut. When looking for tri-tip you may have to ask the butcher at your local market if he or she has this in the back. It sometimes doesn’t make it to the meat display case. Ask for either a tri-tip roast or a triangular roast. In fact, call ahead before they grind it up. If the butcher leaves the fat cap on that is okay. The fat helps to flavor and moisten the meat. You can remove the fat after the cooked meat has rested, if you like. Personally, I enjoy a little of the crispy, smoked fat. The recipe here includes an unusual ingredient – coffee. Coffee and beef pair well together, especially when smoking the meat. It is slightly bitter, so if you are not a fan of coffee feel free to leave it out. The sugar in the rub will offset the bitterness. This recipe will feed approximately 6 to 8 people. You will need 30 minutes to prepare the meat and approximately 2 hours to smoke it. The roast then needs to rest for 20 minutes. 1. In a small bowl, mix together all of the rub ingredients. 2. Place the roast on a cutting board. If the roast has a fat cap on it, score the fat diagonally about an inch apart with a sharp chef’s knife. Turn it 90 degrees and score again to form a diamond pattern. While still on the cutting board, season the meat all over with the rub, pressing it into the roast. Place the roast aside and allow it come to room temperature for 30 to 60 minutes. 3. Place the water in the bowl at the bottom of the smoker. Place the wood chips in the side tray. Preheat the smoker to 225°F. 4. Place the tri-tip, fat side up, on the middle rack of the smoker. Place the drip pan on the rack below the roast. Use a foil sheet pan or line a sheet pan with foil for easier cleanup. Place the digital thermometer in the fatter end of the roast. Close the door and open the vent. Smoke for approximately 2 hours for medium rare. The internal temperature should read 130 to 135°F. Be sure to check the wood chips and water at 60 minutes. Add more if necessary. 5. Remove the roast to a clean cutting board and tent loosely with foil for 20 minutes to allow the juices to be reabsorbed. Slice thinly and serve with a starchy side and a green vegetable. Recipe ideas follow. You can make this the day before or as soon as you take the roast out of the refrigerator to rest before smoking it. This will serve 6 to 8 people. Plan on approximately 45 minutes to make this dish. 1. Place the potatoes and 1 tablespoons of salt in a large pot of cold water. Bring the water to a rolling boil. Turn the heat down to a simmer and cook for approximately 15 minutes, until the potatoes are just tender, not mushy, when pierced with a knife or fork. Drain the potatoes in a colander & allow them to sit until cool enough to handle. 2. In a large bowl, whisk together the mayonnaise, kefir, mustard, herbs, 1 teaspoon of salt, and 1 teaspoon of pepper. 3. Dice the celery and onion. 4. When the potatoes are cool enough to handle, cut them into bite size pieces, about 1 to 1-1/2 inch chunks. Place the potatoes, celery, and onions into the bowl with the dressing. Toss to coat well. Cover with plastic wrap and refrigerate until cold or room temperature. 5. Serve with your sliced tri-tip. I believe there is not a simpler and tastier vegetable than steamed asparagus, especially in early spring when it is in peak season. Try to get stalks that are medium in diameter. Too thin and they will cook to oblivion. Too thick and they will be woody and fibrous. I think 3 to 4 bundles will be a good match for the tri-tip recipe. Simply trim off the hard bottoms of the stalks with a knife. You can test where the cut should be made by snapping the lower 1/4 of a stalk to see exactly where it wants to break. It will speak to you. Place a steamer basket in a large pot and fill the pot with water just to the bottom of the basket. Turn the heat to high until steam starts to form. Lower the heat to medium. Drop the asparagus in the basket. Put a lid on and steam for 2 minutes max. Remove the lid and rotate the asparagus so they all cook evenly. Return the lid and steam for another 2 minutes until just wilted and still vibrant in color. Immediately remove the stalks to a platter and squeeze fresh lemon juice over the top to help retain the bright green color. Sprinkle with salt and pepper. Serve hot, or chill and serve with a drizzle of olive oil as a sort of salad. Keep in mind that your roast is the star of the meal. And, it has all of the flavor and juices. Don’t upstage it with side dishes that are really spicy and flavor forward. This is a mellow cut of beef that just needs a supporting staff to make it shine. The rub is going to help enhance the flavors. Some smoke recipes recommend using a tangy and sweet barbeque sauce on the smoked meat. Frankly, I would reserve the sauce for a well-done cut of meat, such as a pork shoulder that is smoked all day, or a beef brisket that needs a longer smoking time to break down the muscle. This cut of beef pairs nicely with a Zinfandel wine or maybe a Pinot Noir. If you are not inclined to drink alcohol, I think a pitcher of a lightly sweetened iced tea is perfect.